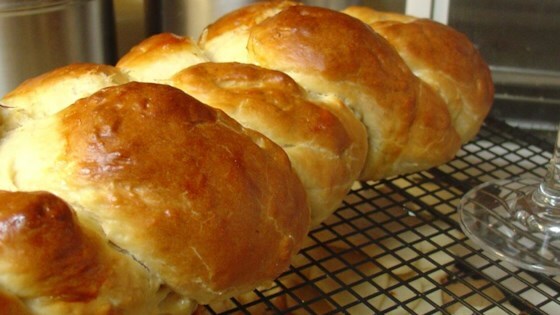 "This recipe is a sweeter version of the classic challah. It was given to me by a friend." Stir the oil, honey, eggs, salt and four cups of flour into the yeast mixture; beat well. Stir in the remaining flour, 1/2 cup at a time, mixing well after each addition. When the dough has pulled together, turn it out onto a lightly floured surface and knead until smooth and supple, about 8 minutes. Deflate the dough and turn it out onto a floured surface divide into 4 pieces and braid. Place the loaf on a lightly greased baking sheet. Cover with a damp cloth and let rise until doubled in volume, about 40 minutes. Meanwhile, preheat oven to 350 degrees F (175 degrees C). In a small bowl, combine the egg white and water; beat lightly. Brush the risen loaf with the egg wash.
Bake in preheated oven for 30 to 40 minutes, or until golden brown. The bread didn't rise the first time so I just kneaded it again and it worked. So good and easy that I am making it with my Preschool class next week. This bread turned out wonderful. It was fun to make too! We ate the whole loaf in two days. The best challah I have made yet!